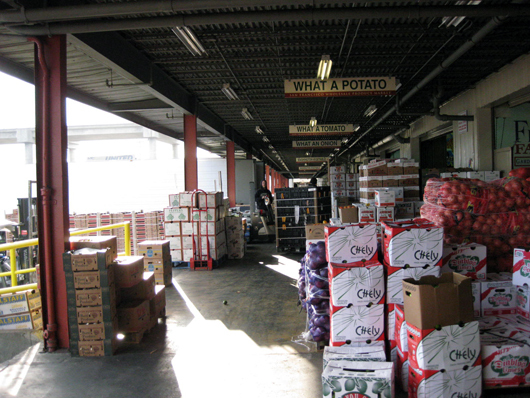 Wholesale produce markets are an essential part of a local food system, hubs where farm products are re-sold to grocery stores and restaurants by aggregators and distributors. Wholesale markets make possible the large-scale distribution that can support market farms, supplementing retail farmer's market and CSA income. Once commonplace in cities, these types of markets have generally been pushed out of urban centers in favor of more profitable and ‘modern’ uses, such as office or condo towers. More common now is a suburban system of private distribution warehouses for chain supermarkets and distributors. For example, Safeway distributes to all of Northern California from a 44-acre facility in Tracy, 63 miles east of San Francisco. In recent years the trend has seen a reversal, as cities begin to plan for more integrated food systems. According to the U.S. Department of Agriculture there are 72 wholesale produce markets currently in operation; 60% of these have been established in the last five years! Cities such as Philadelphia and Detroit have modernized or updated their facilities recently, and it's not hard to imagine that as public demand for local fresh produce grows, so will the revival of wholesale markets. 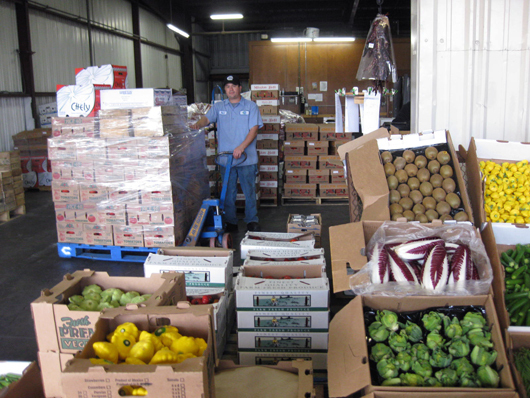 The wholesale market model, as opposed to the grocery distribution center, benefits smaller or newer farmers, since a grocery store will only contract with larger growers. It also encourages diversity in the form of niche marketers serving specialty needs. 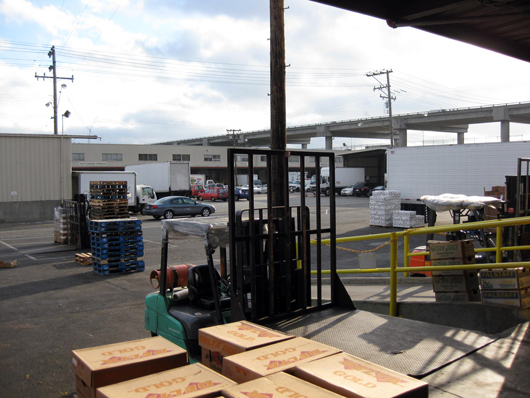 The San Francisco Wholesale Market has occupied its current space on 25 acres at the eastern edge of the city since 1963, after being relocated from a more central location on the Embarcadero during redevelopment. Last fall SPUR offered a walking tour with a behind the scenes glimpse of the Market. Navigating a wholesale market is worlds away from a farmers market. This is the territory of trucks, not pedestrians. And the public is discouraged. Sellers are interested in doing business by the box, not the pound. They also don't want to compete with their customers - the retail stores who serve the public. The Market offers many lessons in the business of produce, as well as the infrastructure requirements of a successful distribution center. (Note: this is a long-ish post. Just want to get to the bottom line? Skip to the end for design notes). Located on 25 acres, in four buildings of a former military supply depot, the buildings face each other across a large paved area, at times a parking lot, and at times a busy street. One feature of the physical buildings that lent to the re-purposing as a wholesale market is the high loading docks, which are appropriate height for trucks to dock at. The other is its location in an industrial area, which has eliminated complaints from neighbors, and helped the Market keep its site. Operating between 7pm and 3am, the Market would be a conflict with residential uses, and perceived as blight in a commercial area. 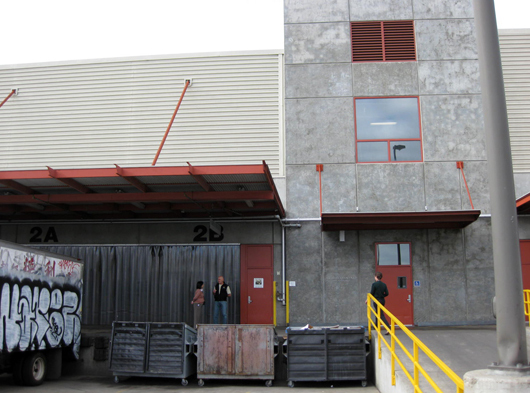 Buildings are large warehouse type, with ‘front’ doors served on the central street by trucks and back doors opening onto rail lines. Located adjacent to freight rail lines, the marine depot had been planned for service by rail. This results in a highly flexible market (from an infrastructure perspective), one that can respond to changes in dominant transportation modes effectively. Inside, the buildings are typically fitted out with large walk-in refrigeration units, and enclosed loft offices. The Market is a public/private partnership, with the City providing the land and a private manager running the operation. 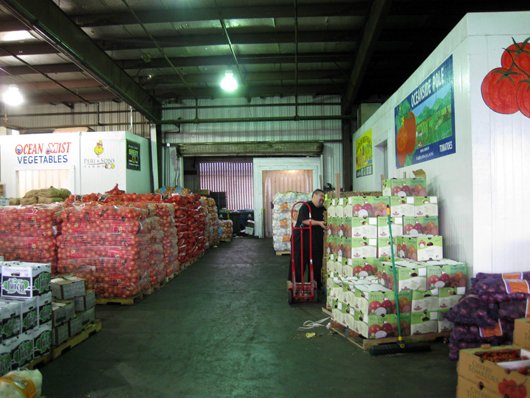 [Typical layout within warehouses - palettes of produce, refrigeration units, offices. Note door to rail access at back of image. Several business models co-exist at the Market, and an eclectic range of people work there. As a quick snapshot, we heard from Cooks Company, a distribution company that employs 80 people, and buys from 200 farmers. Their 26 trucks serve high-end restaurants around the city. Coosemans is a neighboring distibutor, serving supermaket chains and restaurants, and focusing on specialty products like baby cauliflower. Whole Foods has located their warehouse for San Francisco in the Market. Many distributors focus solely on Asian or Hispanic markets, and a cafe/catering company sources their produce from the market and serves up breakfast and lunch on site, as well as catering throughout the city. The market is outdated by current standards, from a facility and health requirements standpoint. There are plans both for renovation and expansion. Read SPUR's recent article for more on the planned work on the Market. What lessons can designers learn from the Market? (If you think you will never design such a thing, think again. On a recent ag-community project I worked on in inland China, an ag-market was one of the central features of the plan, and a key component to the success of the overall masterplan). -Plan for flexiblity. Locate the market near the most types of transportation possible. - Encourage diversity. The SF Market hosts small businesses as well as large. This allows truly niche marketers to flourish. - Integrate sustainability. The current market is essentially a blanket of asphalt. Improvements to the site would include permeable paving, stormwater treatment, greenroofs and shading of paved areas. -Consider circulation conflicts. One of the major reasons behind the re-planning of the market is conflict between passenger cars and truck traffic. Separate these two flows from the start. -Think holistically. Produce markets exclude the public for many good reasons. But this renders their value invisible to the public and allows them to be pushed out. Create a visitor's area, with a demonstration kitchen, a cafe, some retail or an exhibit about how the market works. If people know and love a place, they'll fight to keep it in the city.